Never approach a dog that is growling, snarling or acting defensive in any way. It is important to teach your children that these are signs that a dog is afraid or defending its territory and to back off when these signs are displayed. Always obtain permission from a dog’s owner prior to interacting with the animal. Dogs often pick up on cues from their owners and are more likely to be open to contact when the owner shows signs of accepting you. Additionally, the owner is more likely to know the dog’s temperament and whether it is approachable. When seeing a stray, it is best to keep your distance as the animal may be diseased or have rabies. If a dog charges, it will be faster than you are, so it will be impossible to outrun it. The best option is to find an object you can use as a distraction and feed it to the dog while you make your escape. Options include a backpack, coat, bicycle or any other object that will put distance between you and the dog. If a dog does attack and knocks you onto the ground, the safest response is to curl into a ball, protecting your stomach by pulling your knees up and locking your fingers behind your neck to protect your neck. Once in this position, remain still and there is a high probability that the dog will no longer feel threatened and walk away after smelling or licking you. Our Chicago dog attack lawyers would rather prevent attacks from occurring altogether, as they can take an economic, emotional and physical toll on the owner of the dog and the victim of the attack. Follow these tips to make your own home safer for your family and guests if you own a dog. Socialize your dog early and often so that it understands humans are friendly and not to be harmed. Dogs are more likely to act defensive in the presence of things that are not familiar to them, so familiarizing them with other people will make them less defensive. 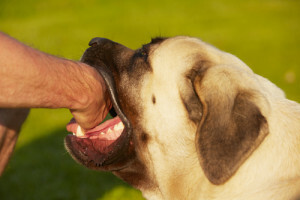 Never punish your dog with your hand, as this establishes all hands as weapons. When your dog encounters another person who offers his or her hand, it may feel threatened and attack. Consider taking your dog to training classes, even if you have experience training animals in the past. This will allow the dog a chance to socialize with other humans and dogs and to earn rewards and positive reinforcement for good behavior. Try to keep your pet away from children under ten years of age, as many dog bites are the result of children playing too roughly with dogs and not understanding their boundaries. If a guest has a young child, it is important never to let the child near the animal without proper supervision. Establish rules for interaction as well, including never to pull, strike or push the dog in an aggressive manner. It is the responsibility of dog owners to ensure that their animals will not harm other people and if you have been harmed by another person’s animal, you are entitled to collect compensation to pay for the treatment of your wounds. Many of the claims are paid for by the owners’ homeowner’s insurance companies, so in the event that the owner of the dog that bit you is a friend, you should not feel any guilt filing a claim. Rosenfeld Injury Lawyers LLC is the most dependable personal injury firm in Illinois and our Chicago dog bite attorneys have recovered compensation on behalf of thousands of clients. Contact us today to learn more about your legal options and how we can maximize your recovery.